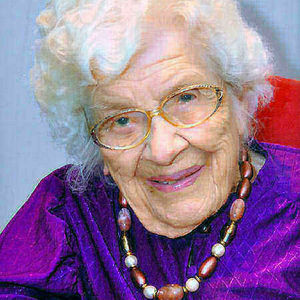 Ann Katherine Kronebusch, age 107, died Wednesday, February 13, 2013, at St. Catherine's Living Center in Wahpeton, ND. Mass of Christian Burial will be celebrated on Monday, February 18 at 9:30 AM at St. John's Catholic Church, Wahpeton, with Rev. Greg Haman officiating. Visitation will be one hour prior to the mass. Interment will be at a later date at Calvary Cemetery, Wahpeton. Arrangements are entrusted to Vertin-Munson Funeral Home, Wahpeton. Ann was born December 19, 1905, in Summit Township to John and Christine (Schmitt) Walcher. She graduated with honors from Wahpeton High School and took special training to earn a certificate to teach in rural schools. She taught all eight grades in a one-room school, Summit #2. She then attended Ellendale Normal School and taught in DeVille School #4. In 1931, she graduated with honors from Moorhead State Teachers College, earning a life-time teaching certificate and was a member of Lambda Phi Sigma honorary society. She taught intermediate grades in Wahpeton Public Schools from 1931-37 and later did substitute teaching at St. John's. She served as secretary of St. John's Ladies' Aid and treasurer of the Christian Mothers. She was united in marriage to Cleon Kronebusch on June 22, 1937 at St. John's Catholic Church. Ann began playing the piano as a young girl, mostly by ear, and continued playing throughout her lifetime. She was also known for her baking. She was a life-long member of St. John's Parish. Ann is survived by one daughter, Mary (Joseph) Grieco of Rhinelander, Wis.; two granddaughters, Lori (Brian) Bosch of Lake Elsinore, Calif., and Lynn (Thomas) Hobbs of Indianapolis, Ind. ; and twin great-granddaughters, Rhiannon and Dana Bosch. She was preceded in death by her husband, her parents, and a sister, Mary Walcher. In lieu of flowers memorials are preferred to St. John's School. I grew up with my cousin. I remember her piano playing with homespun orchestra. Her father was a square dance caller, her sister played the sax, her two uncles played the cornet andtrombone. much old fashion fun. My heartfelt sympathies goes out to the family. Ann was such an amazing woman and a joy to care for while working at St. Catherines. She was the best resident I could have ever had the privilage of getting to know. I will remember her smile, her love for music and most of all her warm smile and telling you how pretty you looked or that she loved us. This flower is for Ann's twin granddaughters. She use to talk about you both. I loved your mom and have great memories of her. Ed and I visited Ann in The fall and she remembered us, so it was a very special visit. We are in Arizona now so will not be at Ann's funeral. We will keep her in our prayers as she travels to heaven. Mary, thank you for calling me. It meant a lot to me. I have fond memories of Ann playing piano by ear. My sympathy with the loss of your mom, but be assured she is at peace.